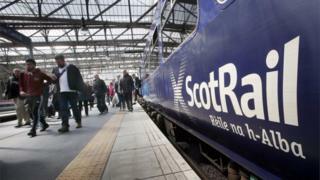 Network Rail has released more details on its £4bn improvement plans for Scotland's rail network. The company, which maintains almost 3,000 miles of track in Scotland, plans to build new stations, expand the network, and speed up journey times. Here, we look at the developments by region. Priorities include finishing off major projects already under way - like the electrification of rail lines through the central belt - as well as boosting services between Scotland's cities and on the west coast. Where will improvements be made? The Carstairs junction is the largest renewal in the CP6 plan. Extensive works will be made including 35-point end interventions and a 10km of plan line track renewal, plus renewal/refurbishment of all outside signalling equipment. The aim is to improve line speeds on the main lines and routes between Glasgow and Edinburgh via Carstairs. The obsolete Edinburgh control system will be renewed, which will enable enhancement pipeline schemes. Renewal and refurbishment works will be carried out at 256 rail structures, including on the New Clyde Bridge and the Forth Bridge. Upgrades will be carried out on the 10 most high risk user-operated crossings. Repairs will be made to more than 900km of track.